Ilford Harman Warmtone Developer is a liquid concentrate hydroquinone developer suitable for the dish/tray developing of all black and white photographic papers both resin coated (RC) and traditional fibre based (FB). It is used at a dilution of 1+9. Warmtone developer is clean working, has excellent keeping properties and gives a warmer image tone to most papers. Warmtone developer is designed for use at ambient room temperatures, nominally 20°C/68°F. 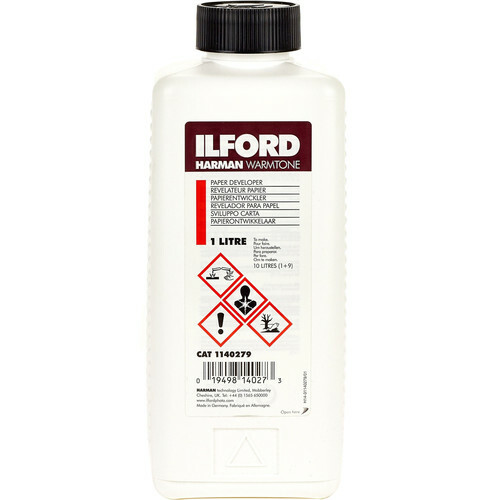 Note: Ilford does not recommend its use for high temperature or machine processing applications. It is NOT suitable for developing films. Box Dimensions (LxWxH) 8.5 x 3.0 x 2.3"
Harman Warmtone Developer for Black and White Papers is rated 4.6 out of 5 by 8. Rated 5 out of 5 by Salem Jack from Great warm tone This Developer really made a difference w/ my prints. It gave it the warm tone that I wanted. This is the first time that I am using it and will buy it again. Made a difference when compared to normal Developer. Rated 3 out of 5 by DifferentLight from Tried it for the first time Used to process Ilford Warm Tone Paper. I was looking for a pronounced warm tone image. The image was only slightly warm. Have not tried toning paper processed in this developer. Rated 5 out of 5 by Anonymous from Favorite Developer! I use this developer with Ilford Warmtone Fiber Paper and love the results. It adds an extra bit of warmth compared to normal developer. I have been using this for a year and will continue to purchase it. Rated 5 out of 5 by Anonymous from Easy to Use I like how this item looks different from other chemicals you buy with it, so you don't get it as easily confused. That goes especially for film developer. Rated 5 out of 5 by Jessica T. from Highly Recommend I highly recommend this developer! I've gotten beautiful results, especially when used with warmtone paper. Rated 5 out of 5 by Patrick from Ilford quality Lovely tones, Ilford quality.....You have to try it!!!! Rated 5 out of 5 by Sienabob from Exceptional tones with Ilford Warmtone fiber paper Great quality. Easy to use. Consistent. Is there a visible difference when used on Ilford RC MG IV ?